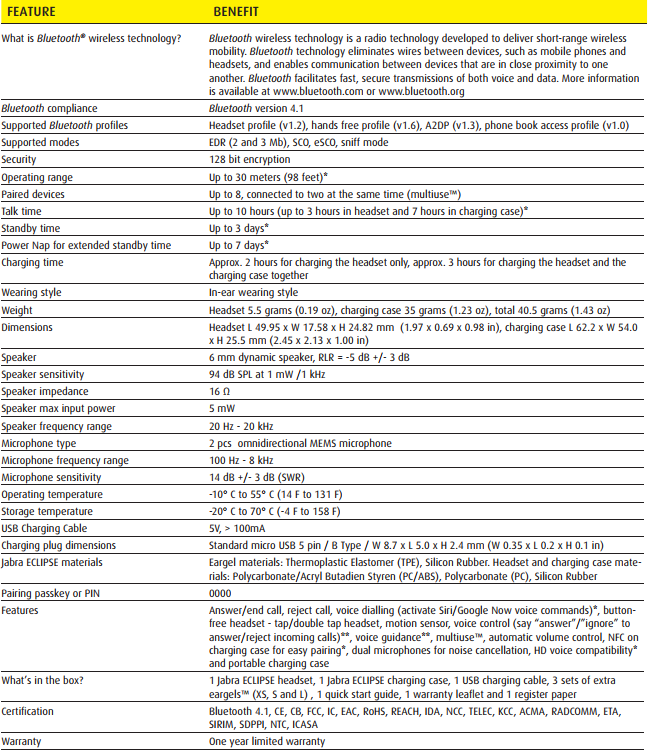 Most Bluetooth headsets usually fall into two categories. The headsets in the first category are known for their long battery life, large frame, great wireless performance and excellent audio, but look like something used in a call center. 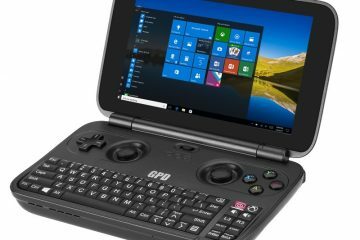 The second group is categorized by a tiny frame, less-than ideal sound quality, subpar wireless performance and battery life. 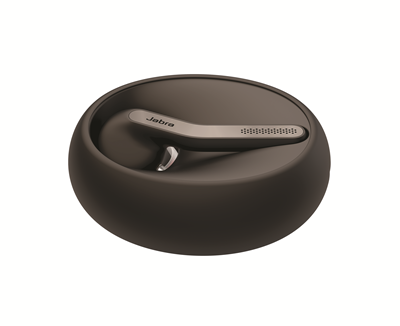 The subject of our review, the Jabra Eclipse with its miniscule dimensions seems to fall into the second category. Is it the case of another stylish tiny headsets that underperforms when it comes to audio, Bluetooth range and battery life? Let’s find out. 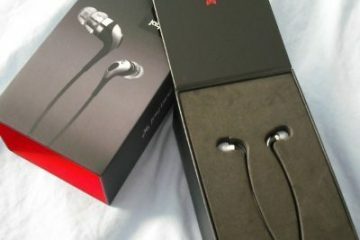 The Jabra Eclipse is a mono in-ear Bluetooth headset and consists of two parts: the Eclipse headset and charging case. A very short microUSB cable is also included along with three ear tips. (Small, Medium and Large). Strangely missing is a charger. Considering the price would have like to see one included. The headset itself comes in either Black or White and has enough juice to last 3 to 3.5 hours, while larger headsets typically have between 7 to 10 hours of talk time. 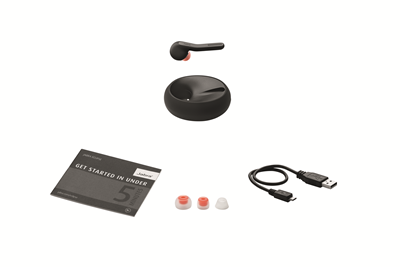 Jabra solves this size versus battery life problem by keeping the headset small, but moving additional battery capacity and charging electronics to a separate case. 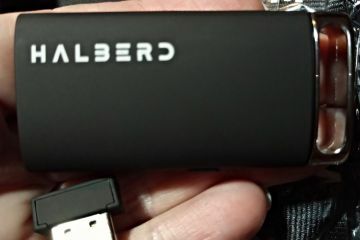 The case not only doubles as a way to store and carry the headset, but is also the only way to charge it, adding an impressive 7 hours of talk time. The headset is so tiny in fact, that there simply wasn’t space left for a USB charging port, instead you’ll find two charging connectors. The charging case is a great solution to not only keep the headset small, yet still offering users the battery life of larger units, but it’s also a convenient place to store the headset. The other side of the story is that the case is essential. Losing the case would basically mean the headset becoming useless. And while the unit offers a total of 10 hours, you will still have to take breaks after those 3 hours for the headset to recharge in the case. Larger headsets have the advantage of being able to keep going without needing intermittent charges. Despite this, Jabra’s solution is ideal, striking a good balance between size, design and battery life. Despite this, Jabra’s solution is ideal, striking a good balance between size, design and battery life. What’s unique about the headset is that it’s completely void of buttons, giving it a clean minimalistic look and keeping it as smalls as possible. No moving parts not only means decreasing the chance of parts breaking or failing, but a less complicated one-piece outer shell exudes the robustness and build quality you’d expect from a metal build. 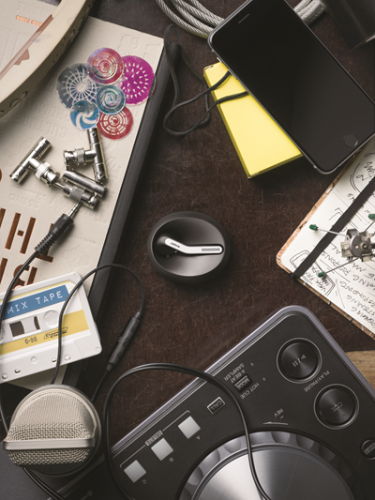 To counter the lack of buttons, Jabra have opted to use taps, double taps and voice control. They’ve included a feature that allows the headset to automatically increase or decrease the volume depending on how noisy your environment is. The feature can be toggled on or off in the app and only seems to work for calls. Sadly, there is no way to manually control the volume on the headset, which means that you’ll still need to reach for your phone to do so. We’ve found that manually raising the volume on the phone was way more effective than the auto-volume feature, which didn’t seem to make any difference. 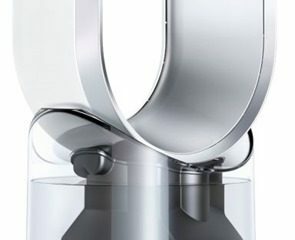 Other noteworthy features include dual microphones for noise cancelation and NFC built into the charging case. Also worth nothing is that the headset is programmable via an app that allows you to tweak and configure various settings and perform software updates. 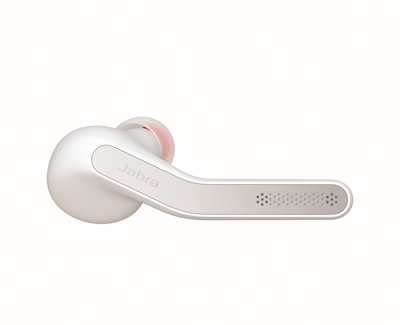 In short, we’re very impressed by the amount of tech Jabra has stuffed in such a tiny headset, all while still scoring big in the design department. What’s unique about the headset is that it’s completely void of buttons, giving it a clean minimalistic look and keeping it as smalls as possible. 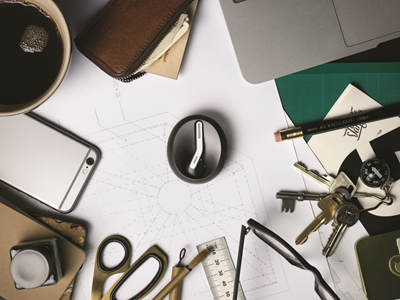 Speaking of design, the Jabra Eclipse is characterized by a minimalistic, button-less design that’s not only elegant but looks very futuristic. It would look at home at high-end and high-tech home or office and is easily the best looking headset on the market today. What’s remarkable is that it does all of this, all while still managing to be practical and intuitive to use. The headset itself, while made out of a black soft-touch plastic, exudes the quality and solidity that you’d expect from a unit made entirely out of metals, lacking any kind of kind of squeak or flex in the material. 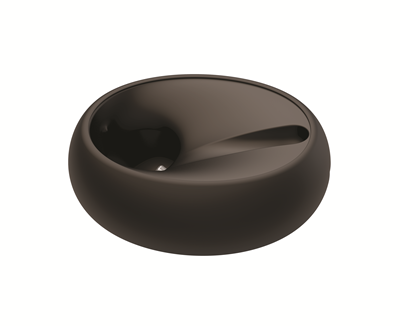 It’s finished almost entirely in a stealthy black matte finish that looks great, is resistant to scratches and doesn’t show finger prints at all. As a bonus it’s also easy to clean. 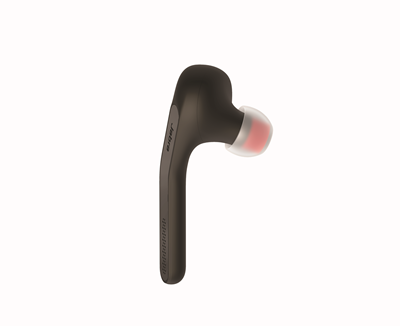 We’re happy Jabra resisted the temptation to create another glossy, fingerprint magnet headset that scratches and get dirty easily. 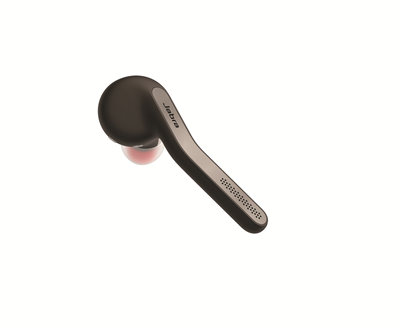 Taking a tour around the headset, the unit is rounded on the back where the micro driver rests and where it connects to the included ear tips. Here you’ll also find two gold charging connectors and a hidden battery status light that blinks green when the unit has a charge of about 20 to 100% or Red when it falls below the 20%. 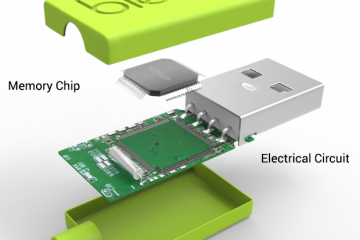 It will also briefly flash a Blue color when connected to a device. 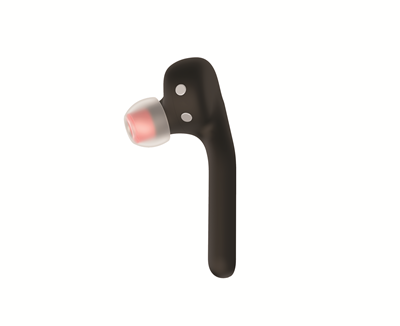 The light elegantly blends into the body of the headset and completely disappears when turned off. The charging case continuous the simplicity, elegant and futuristic theme with a black soft-touch material on the outside and a matte black coating on the inside. Just like the headset itself, it’s also very easy to clean and doesn’t show fingerprints as is the trend with many electronics today. The charging case basically looks like a ball cut in half. On the inside it’s perfectly molded to fit and house the headset and houses two gold charging pins that perfectly align with those on the headset. 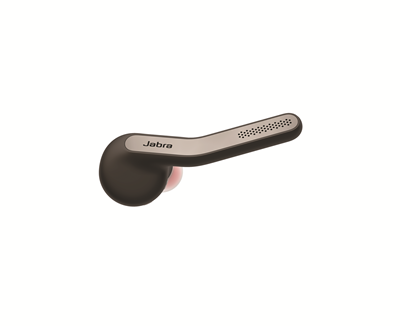 On the bottom of the case you’ll find the multi-function Jabra button to show the charge level or reset the unit. This button also functions as the NFC area, allowing you to simply swipe your phone over the bottom of the case to initiate pairing. The case houses various lights which can be divided into two groups. One light gives info on the headset charge level when docked: either Red (Less than 20%) or Green (20 % or more). 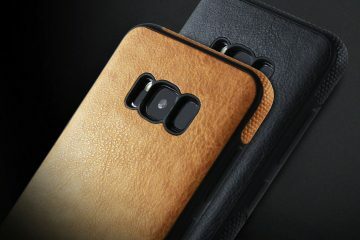 There’s also an array of three lights that will tell you the charge level of the case: 1 light (0 to 33%), 2 lights (33 to 66%) and 3 lights (66 to 100%). All of these lights can be activated by pressing the Jabra button on the bottom of the charging case. The case houses a fairly strong magnet that will push the headset into the right position with a satisfying click. It also hold the headset quite firmly in place, preventing it being dropped, even when held upside down. One downside however is that the headsets docks with the ear tip facing down. If there is any earwax or dirt, it will accumulate in the bay where the headset docked, requiring some cleaning of both the ear tip and the docking cavity to keep things clean. Luckily both are easily cleaned. Overall, we’re very impressed with the build quality and the materials used. We also like the fact that headset is easy to clean. Setup was is easy. 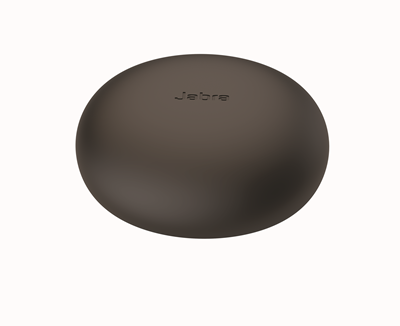 The Eclipse can be connected using two methods: either Bluetooth by holding the Jabra button for 3 seconds (First time you use it, it will automatically go into pairing mode) or by simply holding your NFC-enabled phone near the NFC area beneath the charging case to initiate pairing. While you don’t need the Jabra Assist app, it is handy to tweak various settings. Most importantly, the app is required to update the firmware of the headset which can potentially increase performance, stability, battery life or even add new features. Since getting the headset we’ve received two updates with the latest being 1.29.0. This is a very handy feature as many Bluetooth headsets still require doing software updates via a computer. Other than performing software updates, the app will allow you to adjust the sound profile (favoring clarity or bass for example) and automatic volume can also be switches on or off. You can also toggle voice guidance on or off, which basically will tell you things like battery level and the number of the incoming phone calls. You can also change the voice language, turn Google Now or Siri support on or off and adjust tap controls. The app also includes the digital version of the manual and a digital quick start guide which is very handy. The app even includes a feature to find where your headset is on a map. If in range, the headset can even make a loud, high pitch sound to help you find it. While we love the app, as it allows you to tweak many settings, we dislike that you specifically have to choose “shutdown” to close the app. If you don’t do this, the app will keep running in the background, displaying an icon in the notification area. To make matters even worse, the “shutdown” function is hidden under the “settings” button. 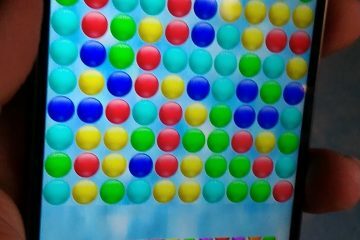 Most users will just press the back or home button, with the app staying active as a result. Another small detail we didn’t like is the outdated looking app icon that basically looks like something you’d find on a Windows 95 PC. Jabra should stick with their “Jabra” logo for the app icons. In short, while not essential, the app is very handy and will help you get the most out of the headset. We also love the fact that a computer is not needed to do software updates. However we’re not a fan of the hidden “shutdown” button and the outdated app icon. These are two easily fixed issue that we hope Jabra addresses in future updates to the app. While not essential, the app is very handy and will help you get the most out of the headset. Using the headset is very simple: you turn it on or off by simply undocking or docking the headset. If the headset is docked, you simply answer the call by undocking the headset. If you are wearing the headset you can simply say “answer” or “ignore” to answer or ignore an incoming call. Alternatively, while wearing the headset you can answer a call by doing a double tap and another double tap to end the call. You can ignore calls by docking the headset or say “ignore.” In a call a single tap will mute or unmute a call. If you tap the headset while not in a call, it will tell you the charge level and if it’s connected or not. Normally I prefer physical buttons, but this combination of voice control and double/single tapping is intuitive and just works. Going back to headsets felt outdated and cumbersome. We do wish however that Jabra had included manual voice controls or some tap method to raise or lower the volume. We do wish they include through a software update. If you are wearing the headset you can simply say “answer” or “ignore” to answer or ignore an incoming call. The sound on the Jabra is excellent, with the required clarity, quality and volume to rival much larger headsets. Surprisingly, the headset was also capable of producing a good amount of sound in the lower part of the audio spectrum, giving it full and rich that’s catered to voices and podcasts. The Eclipse handled the difficult to produce male voices and podcasts with ease. As a result, it was quite enjoyable for calls and would do great for the occasional podcast listening, without the tinny sound you’d usually find with similar small headsets. For music we simply wouldn’t recommend it, but that is to be expected from any mono headset. The in-call audio profiles made quite a difference during calls, adding extra base for example with the enhanced bass profile. We did notice that these audio profiles didn’t make any difference for Podcasts or music. Despite its smaller size, we were impressed how the tiny Eclipse could easily keep up with headsets twice in size when it comes to audio quality. On the other side, callers reported very clear audio that sounded just as good as the microphone on my Galaxy Note 8. In fact, the microphones were so good the callers could hear much of the sounds happening in the background. Ideally this where the noise reduction should have kicked-in and reduce background noise, focusing on just my voice. Perhaps due to its size or the fact that Eclipse only uses two microphones, it simply could not keep up with larger units in muting background noise. Larger units have the advantage of extra space to house several microphones, sometimes as much as 8! The end result is more effective noise reduction. The Eclipse with its limited space and two microphones will outperforms similar small headsets, but simply cannot compete with larger headset in the noise reduction department. Considering its size and the excellent audio quality, we’d say the Eclipse does an admirable job, but larger and bulkier headset that typically have 4+ microphones will simply perform better when it comes to noise reduction. Larger and bulkier headset that typically have 4+ microphones will simply perform better when it comes to noise reduction. When it comes to the Bluetooth connection, the Eclipse managed a solid and stable connection, easily beating similarly sized headsets, but larger headsets again simply had the edge. Considering its tiny frame, the Eclipse did came close to larger units we’ve tested in the past. To conclude this sections we can say the Eclipse will rival many larger headsets when it comes to audio quality and comes close when it comes to Bluetooth range, but as expected larger system will outperform it when it comes to noise reduction. 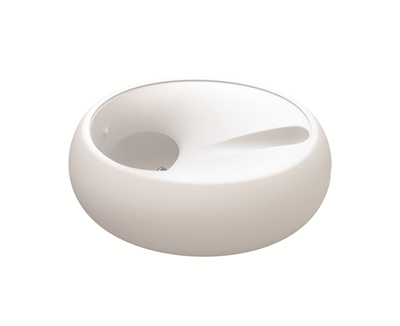 design, the unit is easily to clean, does not scratch easily and feels solid in hand. We do hope Jabra is able to add manual volume controls through voice gestures or tap-controls. 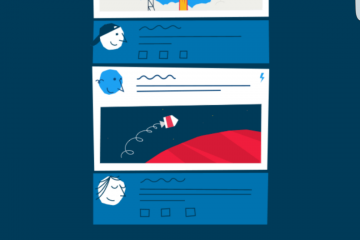 The app, while not essential is handy and will help you get the most out of the headset. We do wish there was an easier way to shut down the unit and Jabra really needs to do something about the outdated app icon. When it comes to performance, the Eclipse impressed us with its audio quality that rivalled larger competitors. But those larger units were able to easily outperform it in the noise reduction department and barely surpassed in the Bluetooth range category. If noise reduction is an important feature for you, we’d recommend larger headsets. But if you’re looking for a well-rounded and stylish headset that comes close to these bigger headsets when it comes to performance, the Eclipse might just be the headset for you. 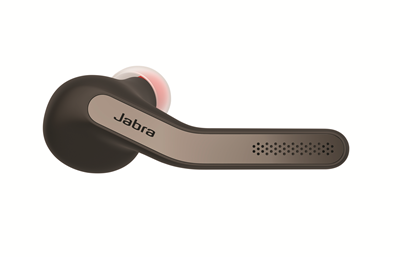 We’re impressed with the Jabra Eclipse and give it an impressive 9.6 out of 10. Jabra assist icon looks dated.